The lake Kenyir houseboat is your ideal home stay vacation destination if you love budget accommodation, basic luxury, water and fishing. I went along for the experience with a group of Japanese tourists who didn't speak that well English and could use an interpreter. 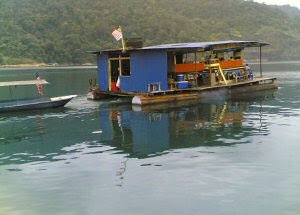 Anyway's, this Kenyir lake houseboat - or "floating device" to be more precise - biggest luxury is a real toilet on board. Cooking is done on board as well and the advantage of this boat is that it can take you far deep on the lake for a relaxing fishing trip. Not that I managed to catch anything, as trying to chit chat with more than 10 people at the same time as fishing isn't a smart option. The other fun part is the smaller boat dangling behind the Kenyir house boat that you could take to get around places on Lake Kenyir where the slow boathouse can't reach. All in all something different, ideal when you come in a group of friends, hire the entire boat and don't bother about any luxury.